Career planning is a life-long endeavor and the first step is to research options. That’s where the Upper Valley Business and Education Partnership (UVBEP) has been playing a role for Lebanon students for over 15 years. wo aspiring chefs had an opportunity to shadow Chef Eli at The Co-op Food Stores Culinary Learning Center. They helped prep the teaching kitchen for a demonstration, attended the demonstration, learned about various culinary programs, helped clean-up after class, and toured the store. 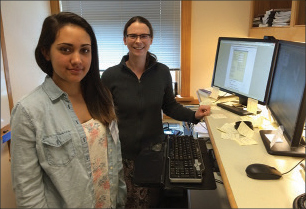 Each Spring, 8th graders go out into the community for Job Shadow Day (JSD). Workplace hosts plan hands-on activities, facility tours and demonstrations to show students what it takes to be successful in their career field. UVBEP provides supporting information, such as job shadowing guidelines, suggested activities, agendas, ice breakers and conversation starters as well as follow up reflection and evaluation forms. • WHERE do you like to work (e.g., indoors, outdoors, in a quiet space, surrounded by activity). • I’m a decent manga/anime artist, designing clothing and characters, writing short stories. Hard worker when determined and concentrated, creative doodling, creative thinker. At Systems Plus Computers, students learned to identify components in a dismantled laptop, and learned about the requirements for various certifications in technician repair. UVBEP staff spend the early winter months recruiting employers who can introduce students to a career that uses some of the interest areas they indicated. Communicating with school staff, matching students with available hosts, and working within transportation parameters, UVBEP taps into the generous Upper Valley community. 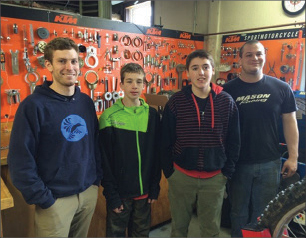 Here’s a Job Shadow Day story with a throwback twist: This year, two 8th grade students from Hartland Elementary School spent the day exploring careers in motorcycle service at Mason Racing in Lebanon. Their hosts, Alex and Dan, are Lebanon Junior High School alumni who also participated in UVBEP’s Job Shadow Day over a decade ago! UVBEP is a nonprofit organization serving 20 schools in the greater Upper Valley region of New Hampshire and Vermont. The Partnership facilitates programs that link schools with local employers, including experiential learning and career planning projects for students and professional development activities for educators. To learn more visit www.uvbep.org or www.facebook.com/uvbep.